Bandwars was a Facebook Application developed for Babelgum to celebrate the Babelgum Music Festival. 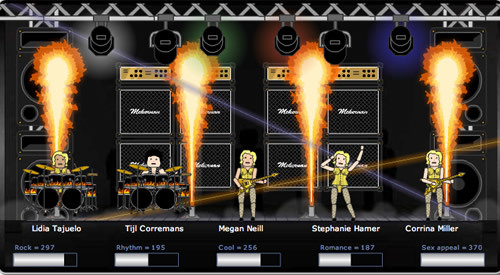 The application allows users to form a band with five members, assign instruments, dress the members in clothes and challenge other bands. Challenging bands and winning would earn the band money, which can be used to purchase better costumes and instruments. Winning challenges also allowed the winner to swap gear with one member from the losing band. The animations and shop were implemented in flash. The remainder of the application was built in PHP. A complex algorithm was written using PHP and MySQL to determine the winner of a challenge. PHP was also used to communicate with the flash widget, acting as a intermediate layer between the interface and the database. The app had just under 13,000 users, with over 160,000 challenges completed by the users. The application is now running unsupported since the original campaign began. You can access it here.